Reagan Lee | Banner |Michaela Miller, junior health science major and defender, strikes the ball in an early seaon conference game against New Mexico State University. 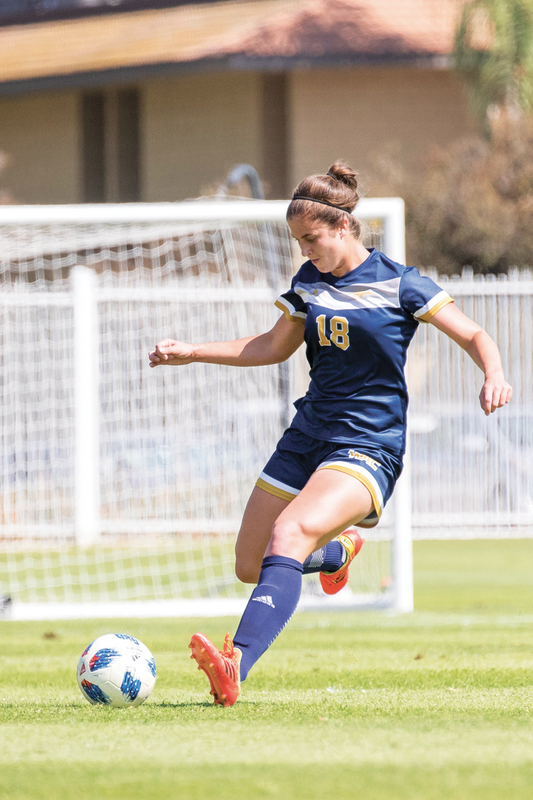 Ending the season with a record of 12-5 and finishing ranked fourth in Western Athletic Conference, CBU women’s soccer said they are content to have exceeded their goals. “Starting the season we set a few goals: We wanted to get 10 wins and we wanted to finish in the top four, and we accomplished both, which is awesome,” said Seth Taylor, assistant coach of the women’s soccer team. Taylor said that for the team’s first year in Division I this achievement would satisfy any coaching staff. “Just the way we finished Division I, if you told any first year Division I coaching staff that you’re going to win 12 games and finish at the top of the conference, they would take it,” Taylor said. Being the new kids on the block, Kristen St Clair, head coach of the women soccer team, said the team knew they had an uphill battle ahead. Finishing the season with a win against the University of Montana on Senior Day, the team said they have left everything on the field. Now that the team had a taste of DI competition, St. Clair knows which teams she should look for next season. “They’re all going to be challenging. (The University of Missouri, Kansas City) is currently the top team, but we want to shoot for every team. We want to take it one game at a time,” St. Clair said. Taylor said he believes intra-team competition would help the team develop and improve in the new season. In their first successful season at the DI level, the team was led by senior history major, Desarae Felix. With Felix graduating, St Clair plans to pass the baton of captin to Hald. Pointing to Hald as the team captain and looking for recruits, St. Clair and Taylor have started preparing the team for the next season and the second year of Western Athletic Conference action.